There’s a reason they say plans change. When my husband and I discovered we were expecting our second child, we felt like we had it under control. Ah, but you know what they say about the best laid plans. When my water broke on a Friday night, I was surprised at how right a friend was who told me it felt like peeing yourself over and over again. 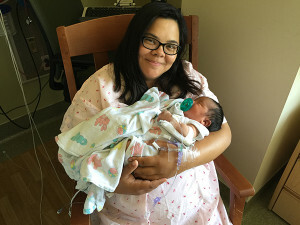 Upon arriving at the hospital, I sloshed as quickly as I could with my husband to the labor and delivery floor. Unlike our daughter, who had to be evicted from the womb, this baby seemed to be doing everything by the book. “We don’t have to be induced this time,” I marveled to my husband, Derek. After being taken to a room, a doctor came in to see how much I was dilated. “Um, so I can’t really tell, which means you’re not really that far along,” she said. How could that be, I asked, adding that my water broke, as if she couldn’t tell by the mountain of wet towels beside me. She assured me it would only be a matter of time and advised me to try to relax, which is easy to say when you’re not the one waiting to push out a human head. Eventually, however, my contractions grew strong enough to earn me placement in an actual labor and delivery room to await the magical 10-centimeter dilation. You see, while we were waiting, every now and then, our baby’s heart would decelerate. We knew this because, in addition to the monitor beeping a significant decrease, the nurse on hand would call a team comprising other nurses and a doctor with the somewhat alarming “decel” message. Finally, my obstetrician, Dr. Hulley, came in during the last “decel” call and calmly recommended I deliver via cesarean section. I felt my heart plummet until the fetal heart monitor reminded me that a more-important someone’s heart rate was decelerating. I immediately agreed to the C-section. To my medical team’s credit, they were amazing. There was a pediatrician on hand in case something went wrong, an anesthesiologist who made sure I didn’t feel anything, several nurses, and the very competent and wonderful Dr. Hulley. Still, I remember turning to Derek, who by then wore a hospital cap and scrubs, and telling him I was scared. This wasn’t the plan, I said. He reassured me this was a common procedure and that we would be holding our baby in no time. It’s times like these I realize that, if plans go awry, there’s no one else with whom I’d rather be. In what seemed like mere minutes, Dr. Hulley showed our son’s little face quickly over the curtain. “Here’s your baby!” she said happily. A minute later, she also showed me his umbilical cord. Sounds routine enough, except this cord featured two “true knots,” which is an expectant mother’s Googling nightmare — a potentially dangerous occurrence that endangers a baby’s oxygen. I believe we narrowly escaped a much different outcome by going off plan and getting him out immediately via C-section. And now, a month after our son was born, as I fight for several straight hours of sleep and sneak showers in between his care, I only have to stop for an instant to remember how lucky I am to hold and comfort my little son in the wee small hours of the morning. —Genevieve A. Suzuki is a La Mesa resident who practices family law. Find out more on her website, sdlawyersuzuki.com. Canine heatstroke: do you know what to do?